The last project was a big one. 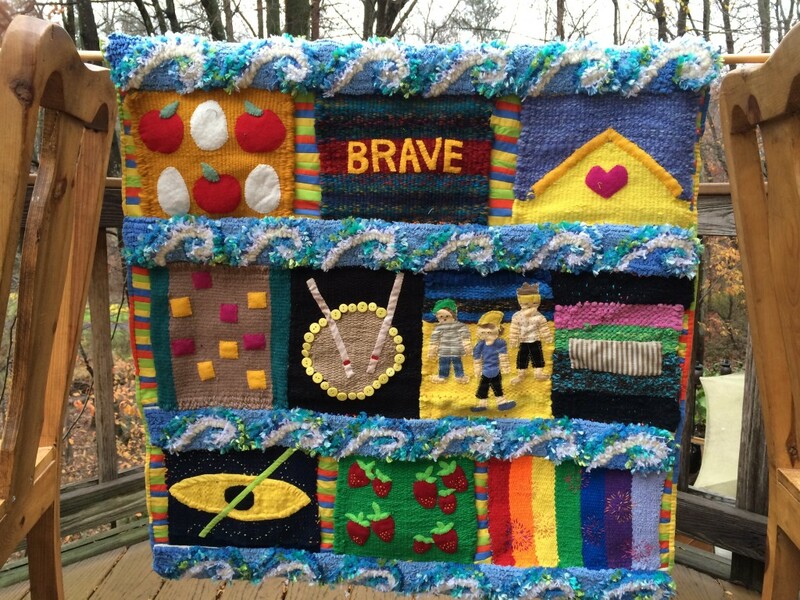 It involved weaving 10 pieces that represent 10 “golden moments” from my life. Then I would join them together and add pockets on the back. I would write something about each moment to put in the pockets. This project was called the shawl. It was challenging to choose 10 moments. My theme was moments that kicked off an epiphany, one that had a long-standing impact on my beliefs and actions. You might have seen the progress reports on the project. Last summer I wove three blocks. Then into the fall and winter, I wove five more blocks. In the spring, I got busy weaving my Trashion Fashion dresses, but I did complete the last two blocks. And this summer and fall, I connected the blocks, made the pockets and wrote the essays. So now it is done! I might put additional items in the pockets with the essays. In the instructions, the woven squares are supposed to connect one to another without a backing. 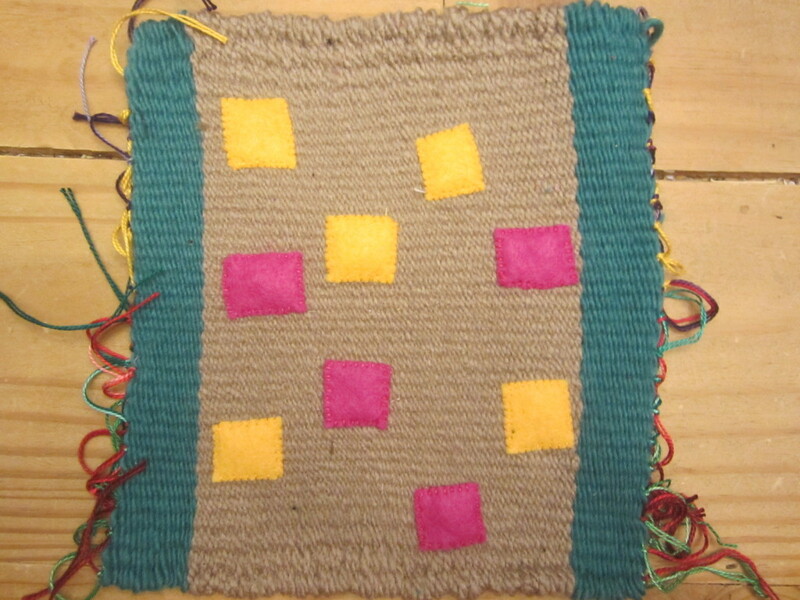 But I was a beginner weaver when I made these squares, so they turned out in quite a variety of shapes. 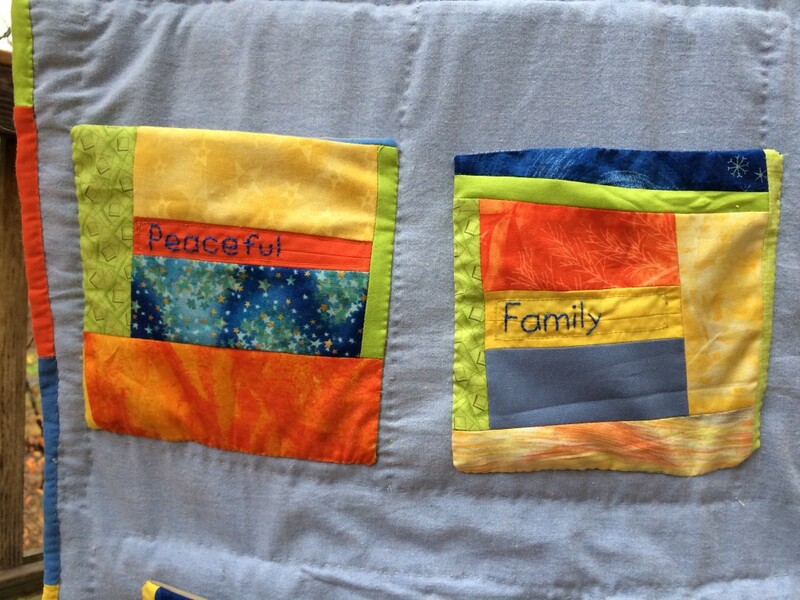 I knew if I sewed them together, the piece would be lumpy. I decided to sew them on a backing to give it more strength. Since the pieces were quite variable in color and materials, I wanted connector pieces that would make it more coherent. 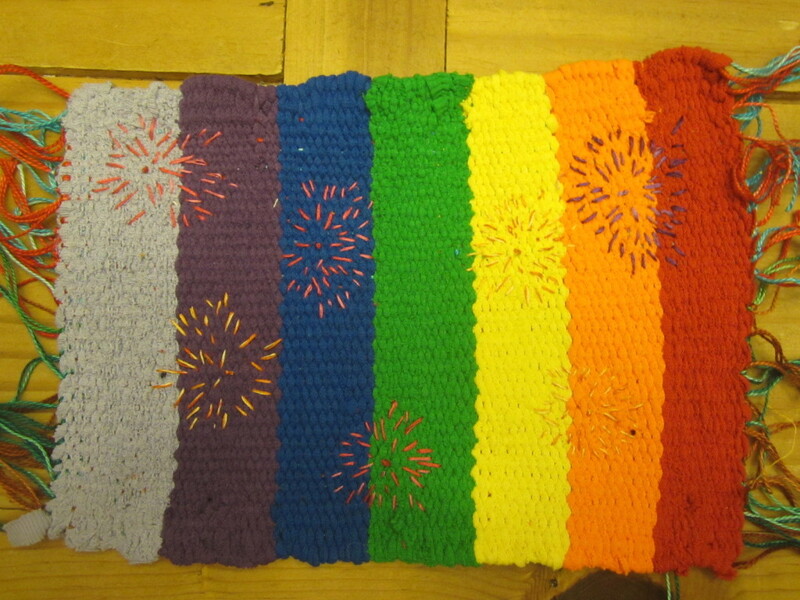 I hooked these horizontal strips using my favorite wools and yarns that I had been storing for the perfect project. They represent waves. That ties into my Wavemaker doll project. For that project, I did a guided meditation where I gave myself the nickname of Wavemaker or Wavey. The waves are ideas or energy that I bring to my world. For the vertical connector pieces, I had strips of orange, green, blue and yellow from birthday decorations. Since these four colors were all in my warp, I thought it added a nice pop to the piece. I continued that color palette with the pockets on the back, choosing my favorite fabrics in my collection from those colors. What Does the Weaving Show: In 1990, while I was attending Pearson College, I spent a week on Hornby Island in British Columbia. Hornby Island residents work very hard to produce almost no garbage because there is no space for a landfill and shipping trash by ferry is expensive. We students spent Service Week working in the Hornby Island recycling center. We lived with a resident in an adorable home where many components were made from driftwood. We picked apples from their trees and gathered eggs from their chickens. 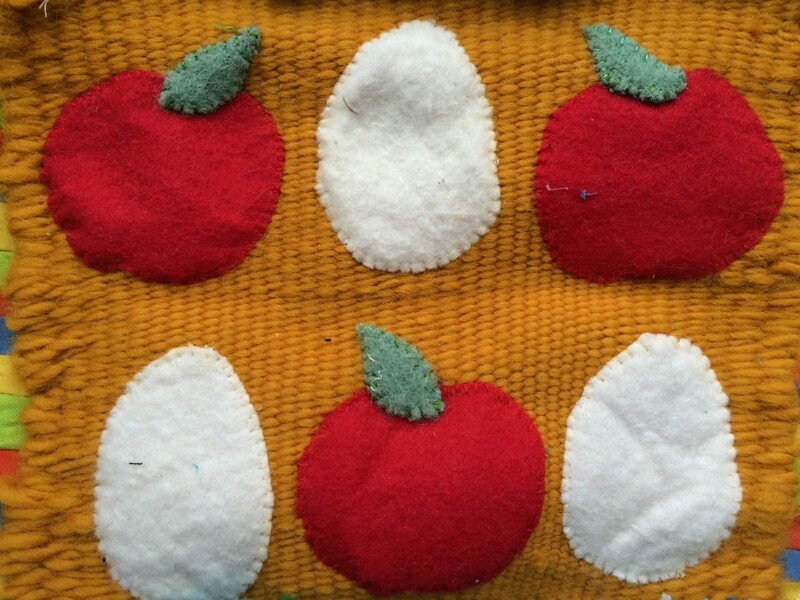 (Thus the apples and eggs in this weaving.) We ate lunch at the local grocery store where everyone brought pottery to purchase their liquid items. 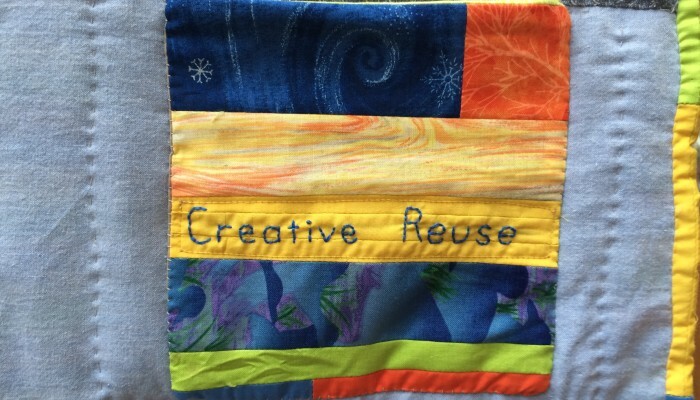 How It Impacted My Life: My mother’s love of secondhand stores made creative reuse seem normal. My summer camps at Kings Landing taught me about using everything you have available. Hornby Island showed me how this attitude can be integrated into every area of modern life. I continued to be interested in composting, freecycling and making costumes from recycled materials. 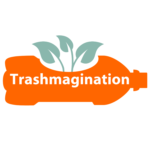 In 2012, I thought of the name Trashmagination. Bob purchased that URL for my 40th birthday which motivated me to start blogging about my creative reuse projects. It is a central party of my identity. Waste bothers me, efficiency makes me feel peaceful. I see the potential in material objects and people’s wisdom. I believe systems can cause people to behave more humanely. Innovation increases faster when there are constraints such as only being allowed to use trash to create. People are better people when they are mindful about their space and objects. Their brains and hearts grow in specific ways when they fix and improve things with their hands and tools. Epiphany: It is possible to build a world where you feel safe and loved. What Does the Weaving Show: Early in our relationship (around 1991), Bob and I camped at Dollar Lake near Dartmouth, Nova Scotia. It gave us space away from our families. I love camping any time because it is the most effective way to disconnect from feelings of responsibility. It allowed us to just be with each other in a bubble. How It Impacted My Life: Bob is my perfect life partner. He makes me feel peaceful and energized. He is a security blanket and wings. His steadfast and creative support for all my endeavors gives me confidence to grow. Since he thinks differently than me, he enhances any situation where we need to figure something out. This is my shortest essay because it is my simplest truth and the one for which I am most grateful. It is possible to 100% trust another person. I don’t have to be good at everything. I can depend on people. Diversity only increases value in a relationship or project. There is no pre-set agenda for my life. It can expand in ways I cannot even imagine. Epiphany: I communicate in a special way and I need to believe in my contributions. What Does this Weaving Show: I visited Eureka! Ranch in Cincinnati, Ohio for the first time in 2010. Innovation Engineering felt completely right. I made a pitch with a lot of passion. The founder of Innovation Engineering, Doug Hall, gave me a lot of positive feedback during and after the pitch. He said it was one of the most passionate pitches he had ever seen. Years later, that’s how he would introduce me to others. How It Impacted My Life: Innovation Engineering helped me be braver because it gave me data, process and language to explain why we need to work in a certain way. When I want to work with others to do something meaningful, I have a never-ending toolkit of ways to approach it. It builds on my journalism and writing skills. It raised the bar for what I expect out of life. It gave me the courage to start my own business, Press the Go Button, in 2015. Anyone can have meaningful work if given the ability to fix the system. Anyone can be creative in the right circumstance with a diverse team. Brainstorming is a waste of time because it does not bring in new data into the system. Great leaders are humble and lead through service. They are still afraid and it still takes courage. Risk can be managed if you break out the work into small enough chunks. You must build systems that encompass people’s feelings if you are going to progress. Epiphany: Being in alignment with others causes me to feel whole, but takes practice. What Does this Weaving Show: This shows a taiko in the dark. At one of my first taiko workshops in 2014, my teacher Mark H. Rooney had us play in unison while standing in a circle. First we could see each other. Then we turned our backs to each other. Then he turned out the lights. It required us to tune into another way of seeing. How It Impacted My Life: I learned to recognize how my body feels when I am doing something that feels right. It is a feeling of wholeness. I learned that I should pursue that type of activity, even if it takes a lot of time. I get this feeling when weaving at a floor loom as well. I used to only get that feeling doing solitary activities. When other people were involved, my mind swirled with social conventions. Often I feel mis-alignment with other people due to my beliefs or energy. But when we play taiko, the focus is a unity of sound. When we perform publicly, I am still learning how to manage my face and body to give the best visual and auditory experience for the audience. But when we practice, I am focused on alignment with other drummers. Alignment is also related to Innovation Engineering. It is the first step towards creating an innovation system. When a group is not working well together, it is most likely a problem with alignment. It’s like following a stream back to the source. If we address the source, the stream will run smoothly and cleanly. Conflict arises not from individuals, but a mis-alignment of values and world understanding. Practicing alignment with other people is like building muscles. I don’t want to just connect with other people. I want to seek alignment with them. Epiphany: Seek new opportunities and sign up even if I can’t imagine how it will turn out. What Does this Weaving Show: While attending Pearson College (1989-1991), I loved ocean kayaking. My classmate Angela organized sunrise kayak trips. We would get bread, chocolate and other items from the kitchen. We set out before the sun rose. When we dipped our paddle into the ocean, tiny plankton glowed like zillions of stars, bioluminescent. We ate on a rocky beach as the sun rose. How It Impacted My Life: When I went to the Pearson College interview, my body was filled with tension. I thought it was impossible that I would be selected. The voices of hope & grief battled in my head. I teetered, trying but not believing. When I was selected, it felt like unreality, dreaming but true. I have been given great opportunities. It is a deep responsibility to live with a full heart. How can I leverage my skills and personality to make it even better? What resources do we have to create something that never existed before? My journey: My brain’s most important task is to see potential and my heart’s most important task is to be open to what it discovers. That’s why garbage day is difficult and Trashmagination exists. That’s why I push my children too much to try their best. That’s why I do Innovation Engineering – to help people see the potential and build on it. There is more good in the world than bad. It is my job to add to the good. Even if something seems impossible, try because I will still learn. When something doesn’t work out, I still have tremendous love and creativity in my life. I have been successful many times when it didn’t seem likely, so assume success. Success is not a lightning bolt, but a hundred boring moments of persistence. Epiphany: Weaving makes me feel peaceful. 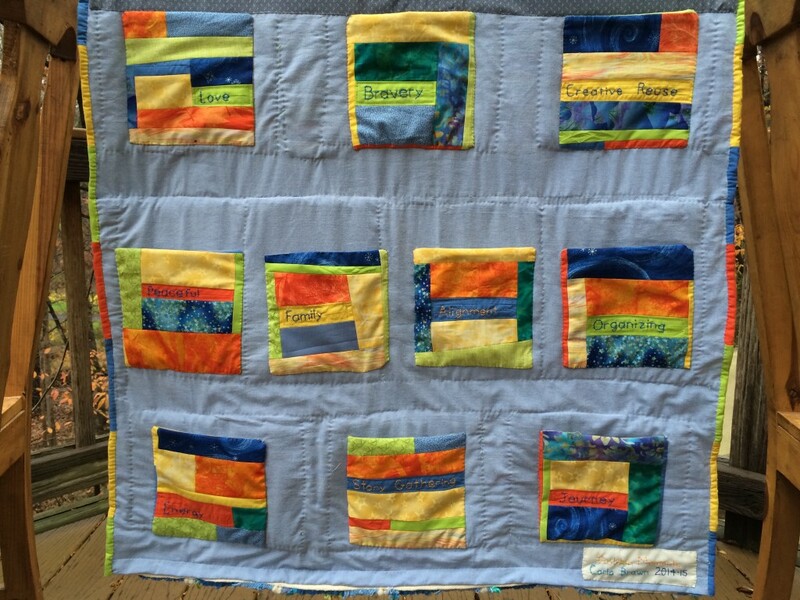 What Does this Weaving Show: In 2009, I organized my first green lifestyles tours near Lake George in New York state. One tour included a visit to Crazy as a Loom weaving studio, where Hilary Cooper-Kenny taught weaving, often from recycled fibers. Many of her rugs were made from damaged socks from a local factory that she cut into loops. 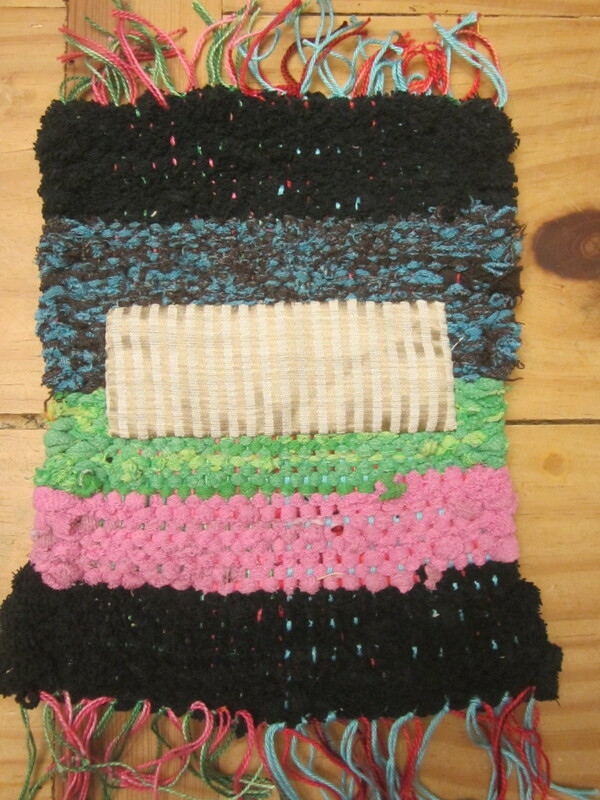 This weaving is made with sock loops. 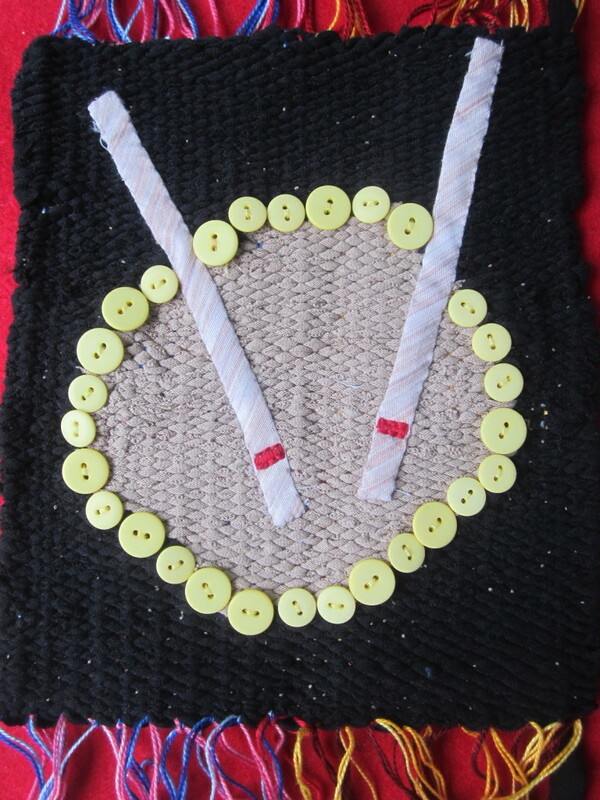 The fabric looks like a reed, or the part of the loom that pushes the weft into place. How It Impacted My Life: The first time I wove on a floor loom was in Finland in 1990. Studios let you rent a loom by the day, with the warp already done. I made a blanket. I loved it. 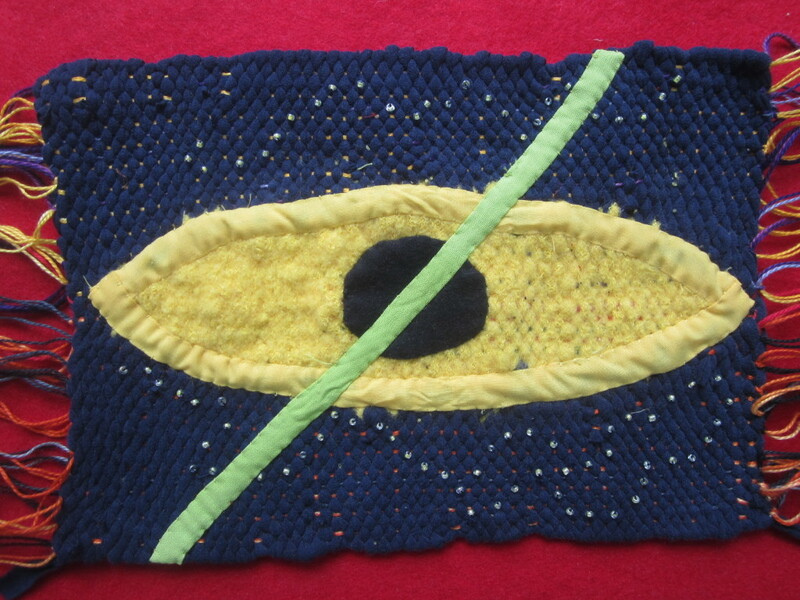 Weaving and rug hooking are the most relaxing activities. It makes the world feel in order. I dreamed of having a floor loom of my own. In 2013, on another green lifestyles tour, we visited weaver Susan Barrett Merrill. She facilitated a group weaving on a Story Loom. In 2014, I worked with her for four months to learn how to weave on a Journey or lap loom. She is the reason why I made this Golden Moments weaving. 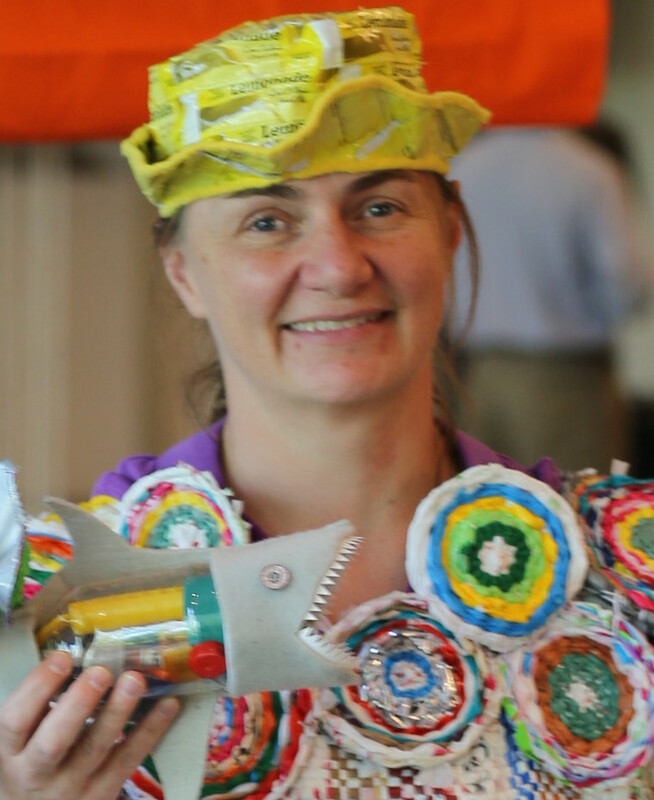 Bob made me a Story Loom in 2015 to bring to a Maker Faire & I also wove two dresses from plastic bags for Nora and me to wear to a Trashion Fashion show. 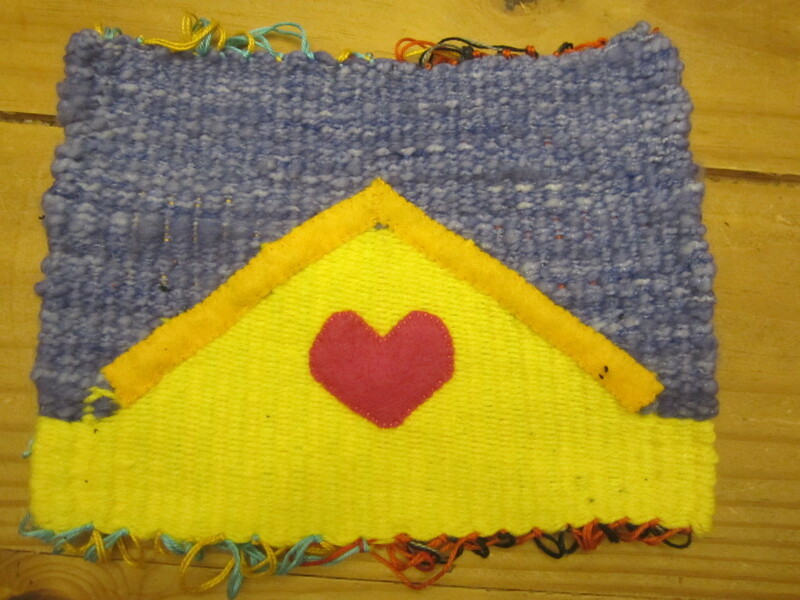 In 2014, when I signed up for a weaving class at Workhouse Arts Center, my teacher gave me a floor loom. It felt like destiny. I look forward to getting it working! When something is important in your life, it will continue to pop up in different forms over and over again. There is something about the warp and weft of weaving that makes my brain happy. Epiphany: Family works best when we help each other but also give each other space. 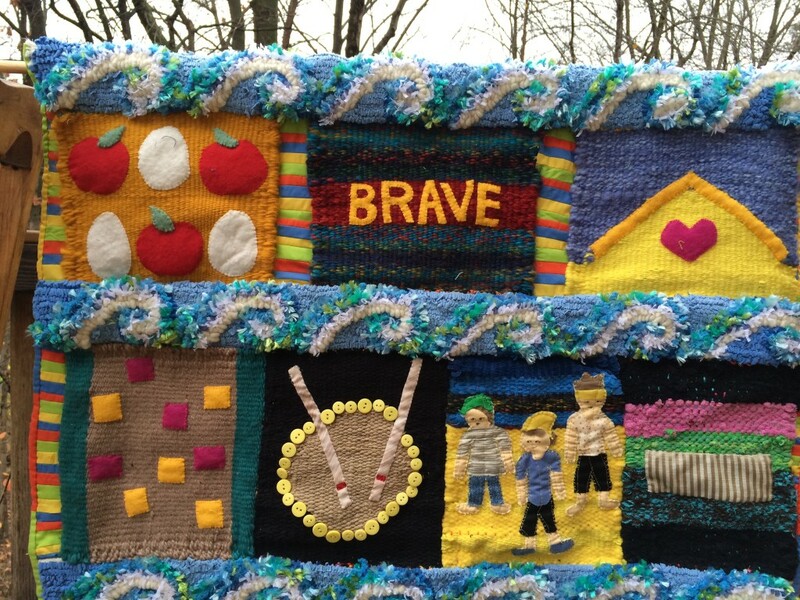 What Does this Weaving Show: At the 2013 Family Nature Summit in Maine, there was going to be a talent show. One day as Nora and I were driving, the song Walking on Sunshine by Katrina and the Waves came on the radio. I told Nora how I did a lip sync when I was a Girl Guide and in grade 10, dressed as cleaning person at Sunshine Carpet Company. My broom was a microphone and guitar. I suggested we could do that at the Summit. Nora was keen so we choreographed. At the Summit, she got nervous. I told her I would do it alone, no problem. My mom suggested she could join us, and then maybe Nora would have the courage? Three generations did the act and it was a big hit. How It Impacted My Life: Being a mom, daughter and the other family roles is a dance of dependence and independence. We want to hold each other and give space. We want to influence each other and let each other be. We are the greatest fans and greatest source of stress for each other. But the bottom line is that we give meaning to each other’s lives. It is only fun to achieve great things and overcome great obstacles when we can share the celebration. I am a better family member when I take time to follow my own passions. We can set limits with each other when it comes to time and energy without limiting our love. Just because we are family does not mean we will approach life the same way. Epiphany: I manage my energy in ways that help me grow, independent of other people’s reactions. 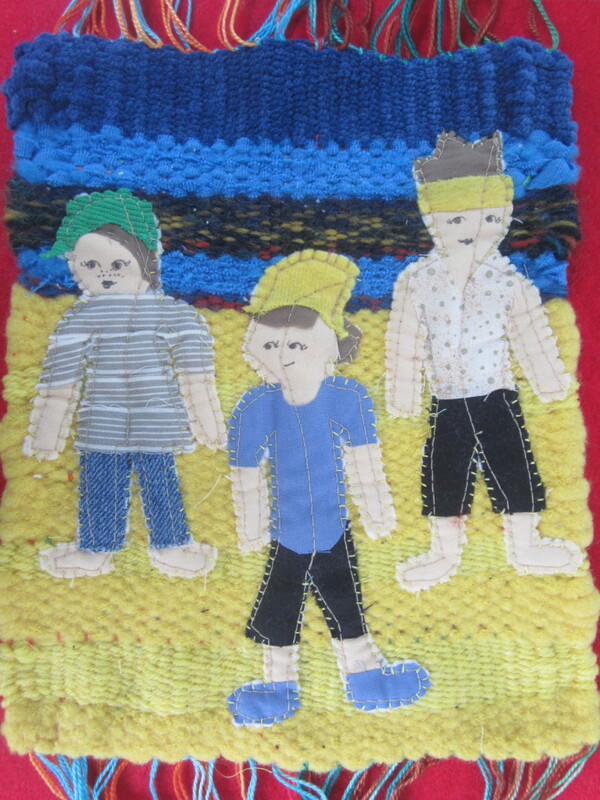 What Does this Weaving Show: In elementary school at Liverpool Street School in Fredericton, New Brunswick, the librarian Ms. Mitton led a dance club. It was the most popular activity. She choreographed popular songs such as The Rose by Bette Midler, Chariots of Fire, It’s Still Rock and Roll to Me by Billy Joel and Beat It by Michael Jackson. When we moved to Nova Scotia, I struggled to find a place. I decided to start a dance club. Tracy and I choreographed. We made dances to How Will I Know? by Whitney Houston, What Have You Done for Me Lately? by Janet Jackson and True Colors by Cyndi Lauper. 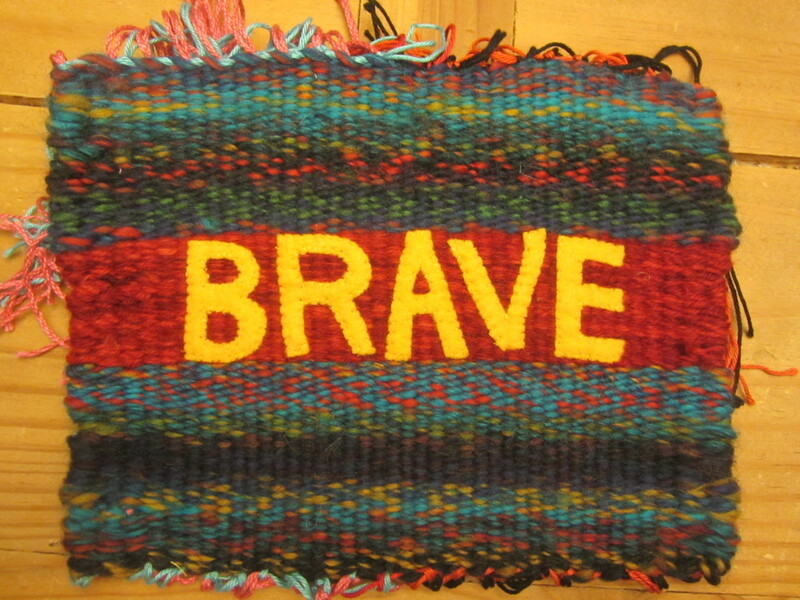 This weaving shows True Colors, my favorite. The fireworks represent the energy created. How It Impacted My Life: In my Pearson College interview, I was asked, “What is the most beautiful thing you ever made?” The dance club flew into my mind. The dance club helped me connect with others and make a new home. It required almost no resources. We didn’t even need adults. I often sign up to teach as a way to learn. I do not need to take a course to “know” it. I can often figure it out as I go. This internal fire or energy is rare. Too many wait for permission or are afraid to fail when self-teaching. Sometimes, when I am “firing up,” the energy comes out too strong. I hit the gas with such force, the whole initiative lurches. This can be upsetting for the people around me. Much of my professional life was people advising me when to show energy and how much. I have tried to accommodate. I may have softened around the edges. But mostly I think it’s a pile of poop. The world needs people with fire, with drama. Learning to manage the ebb and flow of my energy, when to light the fireworks or meditate, when to double-down or laugh it off – this is an ongoing journey. There are no absolute answers when it comes to the right amount of energy to show. It is just social convention. Breaking the rules about energy can be helpful or hindering. It’s all about experimentation. I have a fire that is rare and I should not hide it every time someone tries to intimidate me. Epiphany: Making internal work visible helps people reach a greater potential. 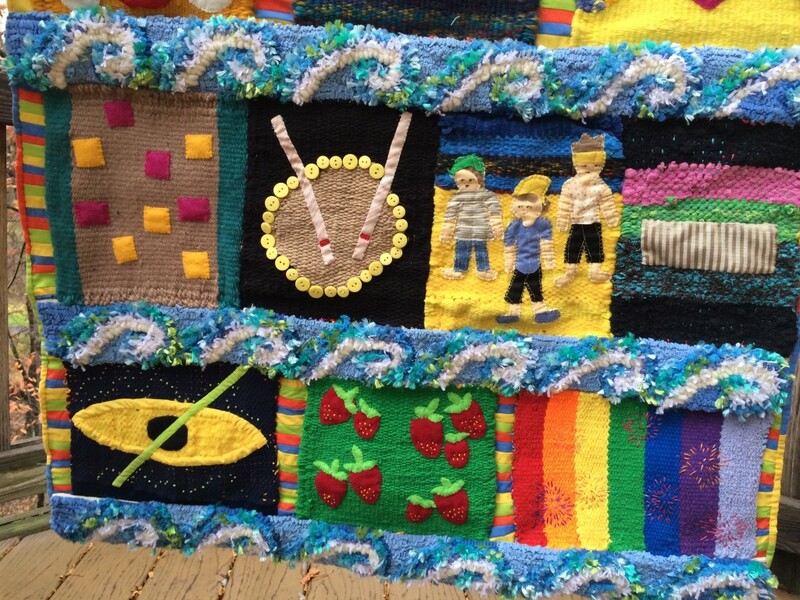 What Does this Weaving Show: In 9th grade, I attended a Youth Leadership Council winter camp. It gave me hope that I could find other young people who wanted to make a difference, particularly an evening where we walked by candlelight and slept in a teepee. Later I attended a Youth Leadership event in Indiana for the summer. The next summer, I helped run leadership programs for university students – a day of team building in the woods. We wore costumes and injected surprising bursts of magic. Even though I was the youngest, it became clear that I had a mind for organizing the pieces. I set up a command center with the day’s schedule in a grid on a brown sheet of paper. Team members arrived each morning to find their schedule and a bag of what they needed to play their roles. As the schedule changed day to day, I taped squares of paper over yesterday’s schedule. It made the work visible and flexible. Beyond logistics, I loved learning how to create sparks in teams through simple activities. I loved learning how to ask open questions and facilitate discovery. How It Impacted My Life: Creating and improving systems is a core function that I bring to every team. I always want to take one step up from where we are to scan for patterns. If things feel confused or chaotic, the system is broken. Fix that first. Once you have a strong system, add magic. You don’t need fancy things to create a good system – just the belief that things can be made visible. Epiphany: Story gathering is my most reverent and challenging passion. It is my spirituality. 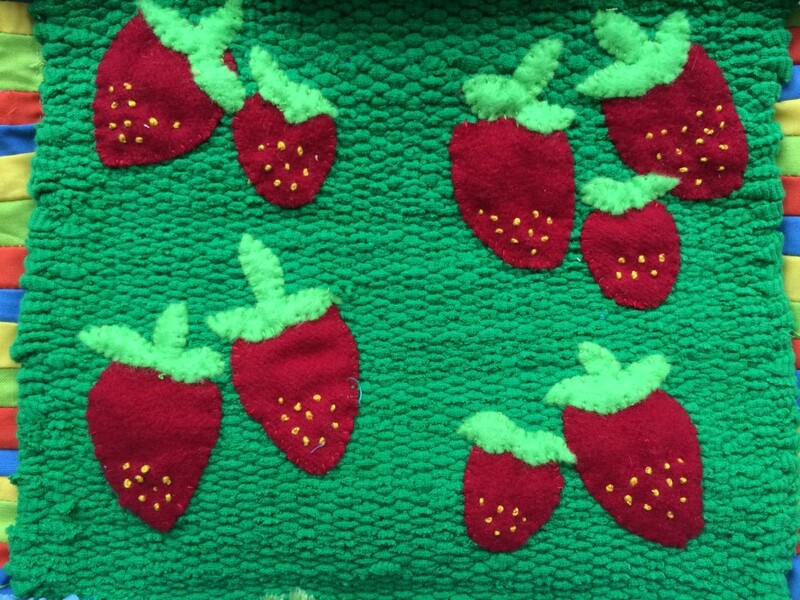 What Does this Weaving Show: My parents would take us to pick berries and rhubarb. One time when we took my brother Kraig, he was shorter than the rhubarb, so we gave him a tall leaf to carry so we would not lose him. My grandfather Bob took great pride in berry picking and jam making. I love to gather treasures. I love to create systems to sort them so they are ready to go when inspiration strikes. I love showing people how to take raw materials and make unexpected wondrous things. Since I was a child I created files, boxes, drawers to store photos cut from magazines, bottle caps, popsicle sticks. I studied journalism because I wanted to use open questions to gather stories. It evolved into digital media, where a story would get packaged up a hundred ways – not boxed into one medium. How It Impacted My Life: When I was a journalist, I shared stories for stories sake – a treadmill where the show must go on whether there is a story worth sharing or not. When I was a marketer, I shared stories to get an outcome whether we had a compelling call-to-action or not. When I was a community builder, I shared stories to bring people together. This last is my favorite part of story gathering. I tried to teach about the value of story gathering when I worked at National Wildlife Federation. Most people could not wrap their minds around the many skills needed to do story gathering and then package up the raw story for reuse. The few who understood – they opened a door to my deepest self. Once Becky Lentz and I were teaching about stories at a leadership course. We gave from deep within to teach. A participant, George Gay, experienced a series of epiphanies. After sharing with the group, he ran and picked me up, swirling me around in a big hug where my feet came off the floor. I felt completely alive. Stories are bits of wisdom, packages of potential energy. The stories we gather are condensed kernels of someone’s giant brave experiment. They failed and failed to get to that place where their fire and actions created success. It is the core of a person. It deserves the utmost respect and appreciation. Stories are powerful at three levels. 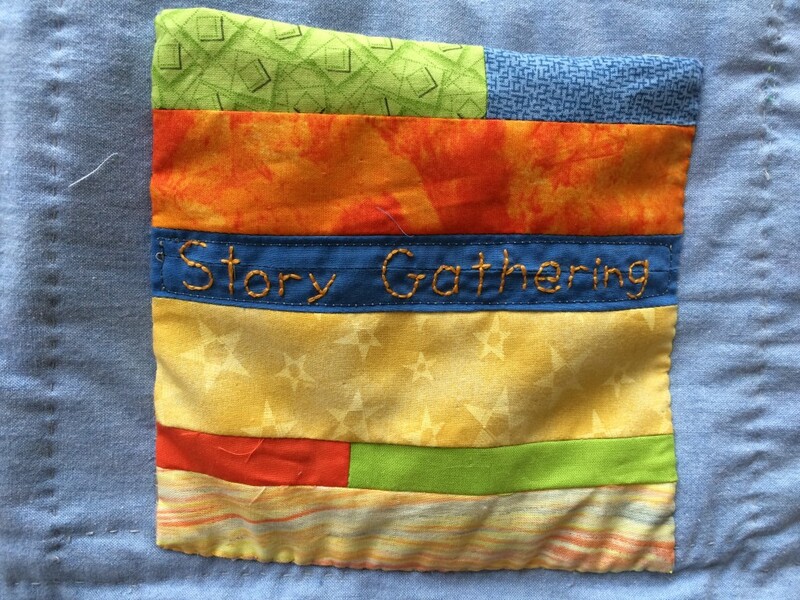 When you gather the story, it helps the story teller process their experiences and grow. When you share the story, it helps the recipient enhance their core values and widen their view. When you store and re-use the raw materials of a story, it builds a mythology for an organization.